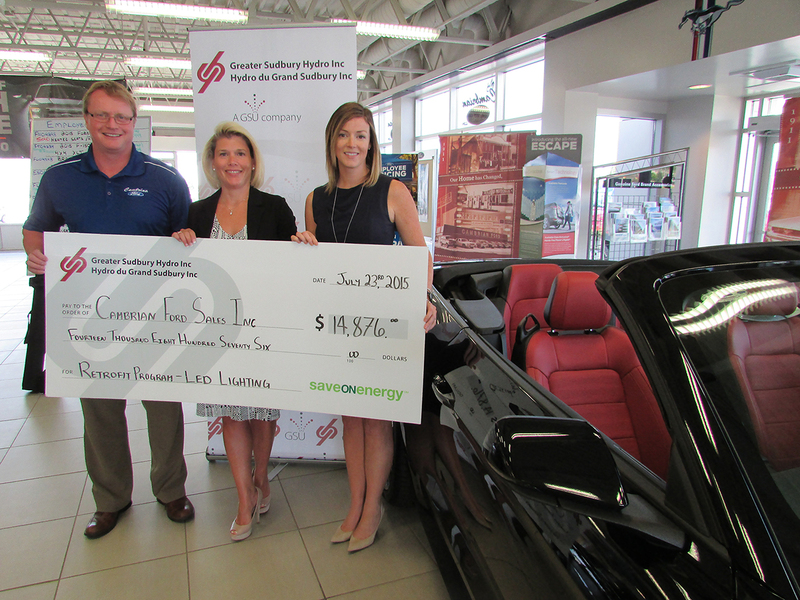 Cambrian Ford Goes Green and Saves Big – Greater Sudbury Hydro Inc.
Cambrian Ford received a cheque for $14,876 from Greater Sudbury Hydro for participating in saveONenergy programs. They replaced all of their parking lot lights and exterior wall packs with LEDs. Not only did they receive incentive money, Cambrian Ford will save approximately $17,600 on electricity ANNUALLY! Cambrian Ford switched all of their parking lot lights and exterior wall packs to LED. That also means Annual Electricity Savings of about $17,600! Our Conservation Coordinators really do help businesses find incentive funding and energy savings!! Our Conservation Coordinators can help YOUR business find incentive funding and energy savings. Call us at 705-675-0517.